Much ink has been spilled on this topic, and I don’t necessarily go into a deep-dive examination of the many different plans and counter-arguments. However, I’d like to point out why I’m particularly concerned about the current health care reform movements. Don’t get me wrong – I DO firmly believe we need some health care reform. There are far too many folks wandering around without any meaningful way to afford health care. There’s far too many insurance companies getting away with near-criminal (if not immoral) dropping or refusal to insure people with pre-existing conditions. There is also a huge problem with rising health care costs – and unless something is done to curb these costs, they will quickly outreach even the most affluent companies/people. These very problems were why the Catholic Church actually set up many of the first health care institutions – well before there were any public ones. However, I’m also a big believer in the notion that past behavior is a great indicator of future performance. While this isn’t true in investing – it IS a very good indicator in people and to a lesser degree for companies, groups, and governments. So why am I so worried about the current plan(s) – especially the government option? Because I don’t believe our government will actually keep the program viable. If you go back and look at the arguments for social security – you’ll hear an almost exact copy of the arguments and problems we currently have. Rising healthcare costs, many people without coverage, families going bankrupt trying to get health care for their parents/grandparents, etc. It’s shockingly similar to today’s arguments. And the promises were also the same – this is a system that will cost money – but protect everyone. So lets do a review of that program and see what has happened. Yes, we now have coverage for our older folks that is for the most part – decent but not great. Social security does a lot of good to many people. My mom receives payments now that my dad has died – and it does help tie her over each month with an extra check to make things better (but she could by no means live on it). However, there is a harsh reality – and that is that social security is scheduled to be bankrupt by 2041, and medicare is scheduled to go bankrupt in 2020. And why is that? Why? Because the government has been ‘borrowing against’/aka stealing what you’ve been paying in social security/medicare for years. Our government is currently $2.4 TRILLION dollars in debt to our social security fund. They have, and continue to, use that money to run *other* government programs. And it’s not just social security – the money sent in for smoking settlement/taxes is ALSO largely not being saved to pay for the future exorbitant costs of smoker’s illnesses – instead – it’s also being used to pay for whatever pork-barreled programs they feel like running to get re-elected. This money will need to be paid back at some future date – or we’ll soon be like hundreds of employees of failed companies that paid into company pension funds for years only to find there wasn’t anything left in the vault but a pile of worthless IOU’s with no way to collect. So my concern is exactly this: We’ve already been giving the government tons and tons of money to cover our health care – but they haven’t been doing that at all ALREADY. So why in the world should I think they’ll do any better with a brand NEW program that will spend even MORE money and will be the motivation to raise taxes even more? Instead, I have every proof to believe our leaders will continue to rob the fund and take a very myopic view of ‘not my problem’. None of these folks will be in government in 20 years when things go bankrupt and the next ‘bubble’ – this one of government programs popping – goes bust. But we all will be here – and we’ll be left holding the double bag of our social security going bust AND having to pay for health care when we need it most – when we retire. So my response on health care reform is this: yes – give us health care reform. Stop insurance companies from denying coverage – either outright denial, or by setting such high premiums it’s impossible to afford. But the government can do that right now by setting legal caps on profitability, costly malpractice insurance/lawsuits, and all of these other issues. Ones that will have to be addressed by a more socialized program anyway. But leave private companies in the game as administrators. That should keep a lot of the representatives/senators/government’s fingers out of the money pie. It’ll then be a pay as you go system. Sure, you might not be able to leverage the cash of the program for future investment, but I argue that that money’s gone anyway if you give it to Washington. No more stealing from one program to pay for their own pet ones; just kicking the funding can down the road. As it is, I’ll be hitting my 40’s in 2020 when medicare goes bankrupt, and 60 when social security goes belly up. After having payed ~30% of my federal taxes into social security every month, it’ll be bankrupt by the time I retire – just before I’ll see any money from it. Now, doesn’t that make me happy? So why should I be excited about giving my trust to guys that are f*-ing it up already? And why am I not down there now demanding accountability from my representatives TODAY? I had to turn on registration for those that want to comment on this site because I’ve been getting a lot of .ru spam ‘comments’ that are extolling the virtue of cheap travel agencies and enlargement of your various organs. Hopefully it isn’t too painful a hurdle and if it stops then I’ll remove the registration. PC Freeplay areas – a huge area with hundreds of Intel supplied machines, and equally large BYOC area that folks brought in their own machines. Servers were set up and all the major games were pre-installed. Just sit down and start up a game with anyone. Tabletop gaming – everything from your more classic D&D, to warhammer setups, to settlers of Catan, and board games from to Risk. Big room to just browse and check out anything you want to play. Go to any of the many rooms with friends, or make some new ones and play. Sessions and talks – tons of 1 hour talks and sessions by developers, experts, and just normal people. I attended a few of the indy developer sessions and found them to be a decent intro for folks looking at the industry. Think GDC lite-lite. Some of the ones on the roster I saw previously at GDC in fact. Movies – sat and watched the fan-made THAC0. Other famous web series and their actors were also there: The Guild, Hey Ash whatcha Playin, and a few others. Concerts each night. I only attended the Saturday night concerts – most notably the Johnathan Coulter concert and two funny guys who’s names escape me. Cosplaying – holy cow – so many people dressed up as their favorite game and cartoon characters. The show floor – since E3 has died, this has gotten to be the gaming convention. Every major game dev was there: EA, Sony, Intel, nVidia, and all the rest. Left 4 Dead 2, God of War 3, Mass Effect 2, and tons of other new and upcoming games were actually setting out to be played. I got a LOT of free shirts and crashed a launch party or two in the hotels around the area. Swine flu? It appears now on the forums that lots of people are getting sick afterward. It’s been called PAX Pox, PAX sars, and lots of the word “swine flu” being batted around. I have seemingly managed to avoid it – but I did do a lot of hand washing and didn’t stay at the hotels usually filled with PAX folks. Seemed to have picked up a nasty sore throat today – but I’m pretty sure that’s because we had a cold snap and I left the window open last night. Doh! Ever meet people you ‘knew’ as a kid? 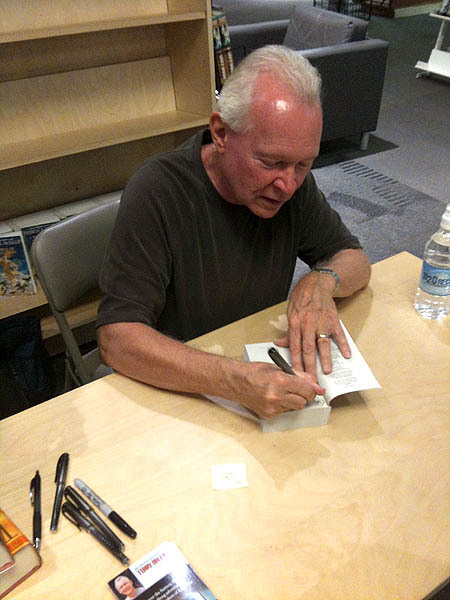 I read the Shannara series by Terry Brooks when I was a kid – before I had read the Tolkien books. So, it was my first exposure to the genre – and memorable for an impressionable youth. I did my trilogy book report on his Shannara series. Brooks lives up in Seattle and comes down to Portland for releases and signings on occasion. I went to his signing at Powells and got a book autographed. I can’t say I was into his later books on Landover, and despite a lot of what people say – the comparisons between Sword of Shannara and Tolkien are a bit too close for comfort. Still, enjoyable to finally meet folks you’ve read and find them to be ‘normal’ and courteous. Terry was indeed those things.